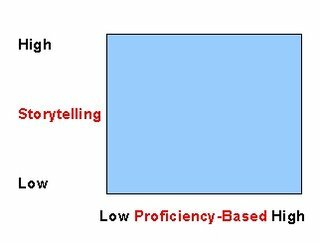 What is the role of digital storytelling and proficiencies? A story focuses often focuses on a critical revelation or turning point about yourself. For example, a student would be high in storytelling and low in proficiency based if she tells of the sadness of leaving her placement. She might tell about the great relationship she developed with students from another culture when she started out afraid of them. Another student may be high in proficiency and low in storytelling if he shows how he did several prescribed subproficiency. 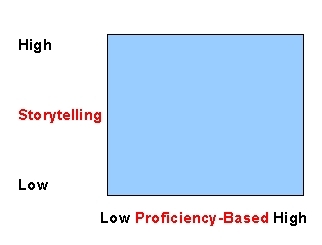 Storytelling and proficiency can be combined. Charlotte, a pre-service teacher, tells the story of how she realized in her placement that Jose was not doing well in school due to his writing skills. She tells of how she noticed that he seemed dazed everytime he was given a writing assignment and how he struggled for a while and then gave up. She relates that she wanted to help him. She describes several classroom writing assessments that she has used and desribes how she analyzed those assessments to find out more about the students in general and Jose specifically. Her pivotal moment was when she discovered Jose’s lack of organization in writing. She tells of how she worked with Jose and a few other students to use graphic organizers on the school’s computers and notecards at home. She shares Jose’s ups and downs in dealing with organization. She shares her joy at seeing Jose begin to organize his ideas and notices how he seems so less stressed over the writing. After many weeks of work, Jose hands in a well organized writing assignment and Charlotte is so excited and happy for Jose. Charlotte has told a story and at the same time demonstrated several proficiency such as those for Assessment (knows of several different assessment, uses pre, during and post assssments; informs classroom learning based on assesssments). None of these tells the whole picture. Most teachers’ tests and quizzes focus on a discrete part of the curriculum and often those assessments focus on the most easily measured but not the most critical parts. For example, a teacher may give a quiz on A Midsummer Night’s Dream that has the students identify what actions the major characters did in the scene but the teacher does not ask how that characters’ action illustrate a major theme in the play. Students can present the big picture of their learning through eportfolios as long as the eportfolios do not chop up the learning into tiny pieces. In most assessments the tiny pieces do not create a combined whole; they are a holding tank of tiny discrete items. For example, some learning institutes (K12 schools and universities) have picked certain proficiency subparts to measure. A proficiency may have four parts – A, B, C, D. The students do each part but they do not show how they four parts become the whole proficiency. The dots do not connect. When students focus on the big picture of their learning (the whole proficiency) such as how they show that they can critically analyze literature (ELA Standard 3, New York State), they can show many different kinds of critical analysis. They can show examples from poetry analysis, from watching a play, from comparing two novels, and from their feedback on another student’s writing. Go from a microscopic view of learning to a wide-angle lens of student learning.